Rudi Berger is an Austrian violinist, singer, pianist, guitarist, and composer born (in Vienna) on November 19, 1954. 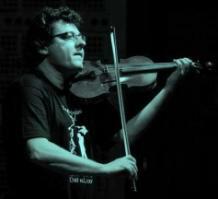 Be that as it may, Rudi Berger has actually become the most-recorded jazz violinist of another country (Brazil) and may very well be the only Austrian jazz violinist in the world, though he has lived and worked outside of Austria for many years. His classical training on violin and piano – begun when he was six - took place at the Vienna Conservatory where he studied with Guenther Schich and Karl Barilly, learning the works of Beethoven, Bach, Mozart, Brahms, Paganini, Kreutzer, Rode, and all the rest. As have other jazz artists, he began playing jazz as a very young student, having been drawn to it from age fourteen. His grandfather (Rudolf Berger) and his uncle were strong influences in this regard. By age fifteen, he had begun to teach himself to play electric guitar and had joined Viennese Blues legend Al Cook in performances and recordings. Later on, he worked as a violinist, pianist, guitarist, and singer in a night club band and with a Viennese Waltz Orchestra. (Jazz violinist Stephane Grappelli, although best known as a violinist, also played saxophone, piano, and accordion.) In 1977, he became a soloist with the newly-formed Vienna Art Orchestra. He was 22 years old. He worked with this orchestra for three years while at the same time forming a Jazz Rock group called Good News in 1978. In 1985 and ’86 he was voted Violinist of the Year by Jazz Live, a European jazz music magazine. By then, Berger had formed the Rudi Berger Quartet, Rudi Berger Project, and Rudi Berger Group jazz ensembles. Berger moved to New York in September of 1986, having already released his first album, First Step, in Europe. In New York, Berger restarted his career by working as a street musician for about a year. During that time, New York jazz radio station WKCR invited him and his New York Quartet to play a two-hour live Jazz Concert Special. Among the jazz clubs he worked in were the Village Vanguard, the Bottom Line, the Village Gate, Indigo Blues, and the Knitting Factory. His international reputation was established in 1988 at the American Music Theater Festival in collaboration with Astor Piazzola, well-known Argentine tango cross-over composer. Since 1990, he has toured in Europe, Japan, the U.S., and South America. Berger’s collaborators in film and Grammy-nominated studio recordings have included Tonhino Horta, Mauro Rodrigues, Yuri Popoff, Gerry Weil, Jay Anderson, Phil Bowler, Mike Clark, Ron McClure, Victor Bailey, Michael Gerber, Peter Madsen, Art Frank, Charles Fambrough, Joseph Bowie, and Nana Vasconcelos. In 1993, Berger performed in Brazil for the first time. Between 1998 and 2002, he traveled between Brazil, New York, and Vienna, moving among three cultures and working in essentially different jazz worlds. He was guest instructor at the University of Minas Gerais in Brazil between 1998 and 2000. In 2003, Berger moved to Brazil permanently, working regularly with some of Brazil’s top composers and musicians, including Toninho Horta, Selma Reis, and Nelson Ayres. Here is one of his YouTube videos and here is one of his recent CDs – In Search of Harmony. Rudi Berger plays a 1992 violin by American violin maker David Burgess. His bow of choice is by English bow maker Howard Green - "a really, really great bow," Mr Berger says.